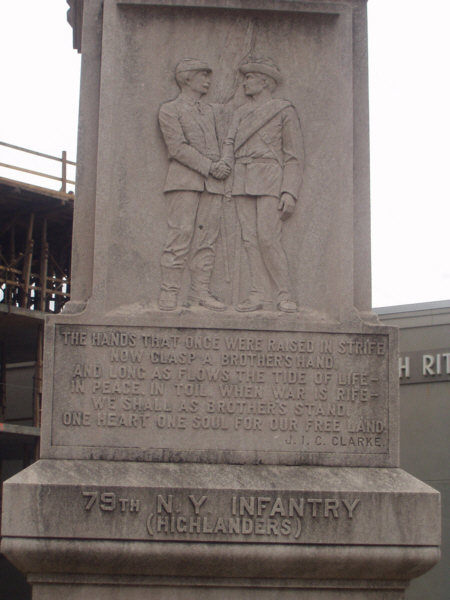 Monument to the 79th New York Voluntary Infantry (the “Highlanders”) at the Battle of Fort Sanders site in Knoxville, Tennessee. The monument is located at the corner of Clinch Avenue and 16th Street in Knoxville, Tennessee which is approximately the location of the earthen fort. It was originally dedicated in 1918 by the 79th New York Veterans Organization. Longstreet ordered the brigades of Humphreys’ Mississippians and Bryan and Wofford’s Georgians, approximately 3,000 men, to make a surprise attack on the fort. The night of November 28th was bitterly cold as the Confederate troops quietly moved into position just 150 yards from the fort, but, in spite of their caution, the defenders overheard them and were prepared for the coming assault. At first light, the Confederates began their attack, struggling through telegraph wire entanglements which the Federals had stretched between stakes a short distance in front of the ditch. In spite of this obstacle the Rebels managed to reach the ditch with relatively light casualties, but it was there that their problems began. They found that there were no scaling ladders with which to climb the slope up to the parapet and the situation was further aggravated by the ground being frozen and covered in sleet which caused the soldiers to lose their footing and fall. In spite of this, some men did manage to reach the top by climbing on the shoulders of their comrades and were able to place their colors on the parapet. There then followed vicious close quarter fighting during which First Sgt. Francis W. Judge of Company K, 79th NY, grabbed the flag of the 51st Georgia from their color bearer and, in spite of a concentrated and deadly fire, was able to return in safety with his trophy into the fort. Judge, who was born in England, was later awarded the Medal of Honor for his action. Longstreet’s men were eventually forced to retreat to the yells of “remember James Island” from the elated Highlanders. The 79th sustained only nine casualties out of a total Federal loss of 20 killed and 80 wounded. They had inflicted terrible punishment on the Confederates who lost 813 men, killed, wounded and missing.